The travel industry has experienced a high level of turbulence in the last decade. Accelerating technological developments, changing consumer behaviours and disruptive business models have changed the game and have become the new status quo. As such, it is vital for current players to envision their role in the future travel industry. The ANVR and Capgemini decided to join forces and provide a collaboration platform for companies in the Dutch travel industry. 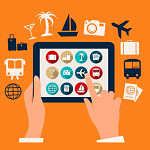 The goal of this platform was to envision the future of (outbound) travel in 2025 by leveraging the expertise of a wide range of travel companies. The platform organized three major workshops with carefully selected experts from the participating companies. Furthermore, two executive dinners were organized with the CXO community, which functioned as a sounding board and provided additional inspiration. The output that was generated during these events has been essential in developing a leading-edge vision on future travel. During this exciting journey, the ANVR and Capgemini performed additional research and analysis to provide inspiration, challenge conventional wisdom and trigger discussions. Finally, they ‘connected the dots’ to create a holistic vision. The results can be found in the report: ‘Travel Tomorrow’.